The knitting pattern for the Tiny Double Moss Diamonds Square forms columns of diamonds using the double moss stitch. This is the fortieth pattern in the Harmony Blanket Knit Along. If you make your own Tiny Double Moss Diamonds Square, I’d love to see it! Share your progress and questions by tagging me on Facebook as @Underground Crafter, Instragram as @ucrafter, or Twitter as @ucrafter. You can also share a picture in the Underground Crafters Facebook group. Sign up for my weekly newsletter and get a coupon code for your choice of one of my premium patterns and other subscriber goodies. Plus, you’ll never miss one of my free patterns again! Add the Tiny Double Moss Diamonds Square to your Ravelry favorites or queue. Form columns of textured diamonds with the double moss stitch. Lion Brand Vanna’s Choice yarn (100% acrylic, 3.5 oz/100 g/170 yd/156 m) – 1 skein in 135 Rust, or approximately 41 yd (37.5 m) in any medium weight yarn. Rep instructions between brackets as indicated. Pattern repeat is any multiple of 6 sts, + 1 sts, + 8 sts for borders. Row 1: (RS) Sl 1, k3, *k3, p1, k2; rep from * across to last 5 sts, k4, p1. Row 2: Sl 1, k3, p1, *p2, k1, p3; rep from * across to last 4 sts, k3, p1. Row 3: Sl 1, k3, *k2, [p1, k1] twice; rep from * across to last 5 sts, k4, p1. Row 4: Sl 1, k3, p1, *[p1, k1] twice, p2; rep from * across to last 4 sts, k3, p1. Row 5: Sl 1, k3, *k1, p1; rep from * across to last 5 sts, k4, p1. Row 6: Sl 1, k3, p1, *k1, p1; rep from * across to last 4 sts, k3, p1. Row 7: Sl 1, k3, *k2, [p1, k1] twice; rep from * across to last 5 sts, k4, p1. Row 8: Sl 1, k3, p1, *[p1, k1] twice, p2; rep from * across to last 4 sts, k3, p1. Rep Rows 1-8 until square measures approximately 5.5″ (14 cm), ending after Row 8. © 2018 by Marie Segares (Underground Crafter). This pattern is for personal use only. You may use the pattern to make unlimited items for yourself, for charity, or to give as gifts. You may sell items you personally make by hand from this pattern. Do not violate Marie’s copyright by distributing this pattern or the photos in any form, including but not limited to scanning, photocopying, emailing, or posting on a website or internet discussion group. If you want to share the pattern, point your friends to this link: https://undergroundcrafter.com/blog/2018/10/04/knitting-pattern-tiny-double-moss-diamonds-square. Thanks for supporting indie designers! The knitting pattern for the Broken Lines Square combines a traveling diagonal stitch pattern with horizontal garter “stripes” to create an interesting texture. This is the thirty-eighth pattern in the Harmony Blanket Knit Along. If you make your own Broken Lines Square, I’d love to see it! Share your progress and questions by tagging me on Facebook as @Underground Crafter, Instragram as @ucrafter, or Twitter as @ucrafter. You can also share a picture in the Underground Crafters Facebook group. Sign up for my weekly newsletter and get a coupon code for your choice of one of my premium patterns and other subscriber goodies. Plus, you’ll never miss one of my free patterns again! Add the Broken Lines Square to your Ravelry favorites or queue. 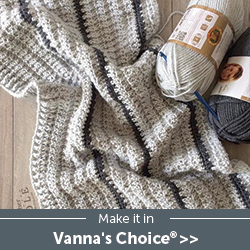 A traveling diagonal stitch pattern combines with horizontal garter “stripes” to create an interesting texture. 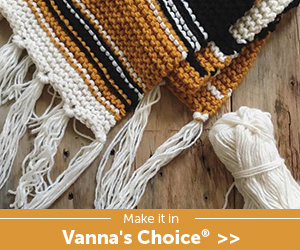 Lion Brand Vanna’s Choice yarn (100% acrylic, 3.5 oz/100 g/170 yd/156 m) – 1 skein in 124 Toffee, or approximately 41 yd (37.5 m) in any medium weight yarn. Pattern repeat is any multiple of 5 sts, + 2 sts, + 8 sts for borders. Row 1: (RS) Sl 1, k3, p1, *p1, k4; rep from * across to last 5 sts, p1, k3, p1. Row 2: Sl 1, k4, *p3, k1, p1; rep from * across to last 5 sts, k4, p1. Row 3: Sl 1, k3, p1, *k2, p1, k2; rep from * across to last 5 sts, p1, k3, p1. Row 4: Sl 1, k4, *p1, k1, p3; rep from * across to last 5 sts, k4, p1. Row 5: Sl 1, k3, p1, *k4, p1; rep from * across to last 5 sts, p1, k3, p1. Row 6: Rep Border Row 2. Rep Rows 1-6 until square measures approximately 5.5″ (14 cm), ending after Row 5. © 2018 by Marie Segares (Underground Crafter). This pattern is for personal use only. You may use the pattern to make unlimited items for yourself, for charity, or to give as gifts. You may sell items you personally make by hand from this pattern. Do not violate Marie’s copyright by distributing this pattern or the photos in any form, including but not limited to scanning, photocopying, emailing, or posting on a website or internet discussion group. If you want to share the pattern, point your friends to this link: https://undergroundcrafter.com/blog/2018/09/20/knitting-pattern-broken-lines-square. Thanks for supporting indie designers! The knitting pattern for the Uneven Cable Square features an uneven cable over a seed stitch background. The uneven cable really pops, while the seed stitch adds great texture. This pattern is the twenty-seventh square in the Harmony Blanket Knit Along. If you’re following along with the Harmony Blanket Knit Along, you probably love learning new knitting stitch patterns as much as I do. For each of the 10 patterns I’m designing in the Harmony Blanket KAL, I’m highlighting the book where I came across the stitch pattern. I found the pattern for the uneven cable in Vogue Knitting: The Ultimate Knitting Book: Completely Revised & Updated by the Editors of Vogue Knitting Magazine, my new favorite knitting reference book. You can read my full review here (and, if you’re seeing this on or before July 11, 2018, you can also enter the giveaway for your chance to win a copy). If you make your own Uneven Cable Square, I’d love to see it! Share your progress and questions by tagging me on Facebook as @Underground Crafter, Instragram as @ucrafter, or Twitter as @ucrafter. You can also share a picture in the Underground Crafters Facebook group. Sign up for my weekly newsletter and get a coupon code for your choice of one of my premium patterns and other subscriber goodies. Plus, you’ll never miss one of my free patterns again! Add the Uneven Cable Square to your Ravelry favorites or queue. An uneven cable is worked over a seed stitch background. Lion Brand Vanna’s Choice yarn (100% acrylic, 3.5 oz/100 g/170 yd/156 m) – 1 skein in 173 Dusty Green, or approximately 42 yd (38.5 m) in any medium weight yarn. Cable needle. You can find a list of substitutes for a cable needle and a tutorial for knitting cables without a cable needle in this video by Lion Brand here. 18 sts = 4″ (15 cm) in pattern. Exact gauge is not critical for this project. 5-st LC – 5-stitch left cable – Slip 3 sts onto cable needle, hold cable needle at front, k2 from main (left) needle, k3 from cable needle. Pattern repeat is any multiple of 5 sts (for cable), + even number of sts (for seed st) + 8 sts for borders. To change this pattern for a larger or smaller number of stitches, keep the borders (first and last 4 sts of each row) the same, then work seed stitch [p1, k1] across to stitch before cable, p1, work cable, p1, [k1, p1] across to border. On wrong side, work p across cable. You can find a list of substitutes for a cable needle and a tutorial for knitting cables without a cable needle in this video by Lion Brand here. If you’ve never knit cables before, this video will also help you understand the basic construction. Row 1: (RS) Sl 1, k3, [p1, k1] 3 times, p1, 5-st LC, p1, [k1, p1] 3 times, k3, p1. Row 2: Sl 1, k3, [p1, k1] 3 times, p7, [k1, p1] 3 times, k3, p1. Row 3: Sl 1, k3, [p1, k1] 3 times, p1, k5, p1, [k1, p1] 3 times, k3, p1. Rep Rows 1-6 until square measures approximately 5.5″ (14 cm), ending after Row 2, Row 4, or Row 6. © 2018 by Marie Segares (Underground Crafter). This pattern is for personal use only. You may use the pattern to make unlimited items for yourself, for charity, or to give as gifts. You may sell items you personally make by hand from this pattern. Do not violate Marie’s copyright by distributing this pattern or the photos in any form, including but not limited to scanning, photocopying, emailing, or posting on a website or internet discussion group. If you want to share the pattern, point your friends to this link: https://undergroundcrafter.com/blog/2018/07/05/knitting-pattern-uneven-cable-square. Thanks for supporting indie designers!